Who is it for? 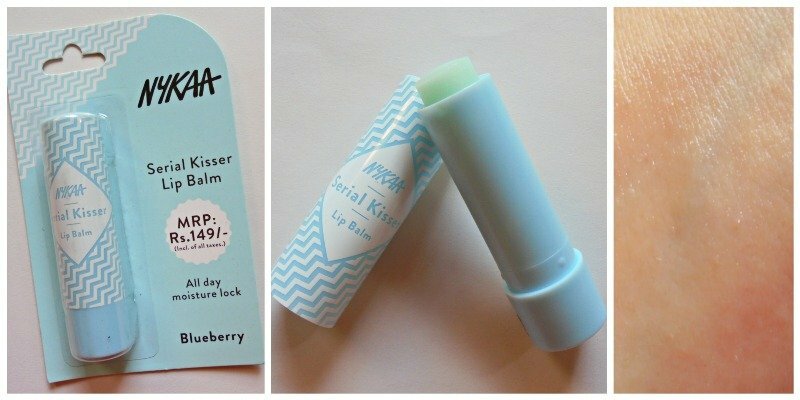 Nykaa Serial Kisser Lip Balm Blueberry is a paraben free transparent lip nourisher with awesome blueberry fragrance. Though this is designed for dry and flaky lips, everyone can use this. This lip balm comes with a cute looking round bullet with wavy patterns all over the lid. The body of the bullet is colored in pastel blue. The packaging looks attractive for sure. The packaging is quite secure and sturdy; I have had no problem to carry this tiny bullet in my purse. The patterns are printed on the plastic body of the lid so they might wear off with regular use. Though the lip balm looks light blue in the container, it is purely transparent without any tint. The formula is moisturizing and feels comfortable on the lips. It does not feel sticky so it can be applied under matte lip color. It has a moderately intense blueberry fragrance. It smells like blue berry soda and ice creams. I love blue berry fragrance so this one has become a favorite! This vegan lip balm has a medium thick and very nourishing formula. Still, the texture is non-sticky. It does not come with SPF so I apply it when I am at home and as an overnight lip balm for soft lips. I apply it in a thick layer and the next day I wake up with plump looking lips. It heals chaps with regular usage and makes the dead cells of my lips soft. It becomes easy to exfoliate the lips after an overnight application of this. It can also be used under liquid lipsticks. This way the liquid lipstick stays moist for longer and does not exaggerate fine lines of the lips. What do I like about this lip balm? What I dislike about this lip balm? I am a fan of blue berry fragrance so definitely buying this moisturizing lip balm from Nykaa again. I would suggest it to people looking for tint free lip balms without paraben. The packaging looks os cute and having them your h=your handbags is really making me feel excited. I do love the flavor of blueberry but I think this product need more and more reapplication. Yes it needs frequent reapplication just like any other lipbalm. The brand shouldn’t have mentioned the all day last claim. Otherwise it’s a nice balm for the lips.